There's a Pro Soccer Player Called "Pikachu"
Whether you call it “soccer” or “football,” that doesn’t matter here. What does is that this dude is known as Pikachu. This, of course, is Pikachu, the Pocket Monster. And, via Globo.com, here is Pikachu, the Brazilian soccer player. “Yago Pikachu” to be more exact. The Brazilian player was born Glaybson Yago Souza Lisboa, but as Slate explains, in Brazil, players typically go by nicknames. 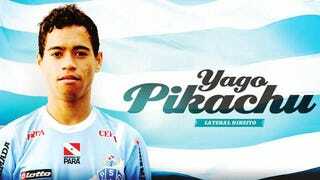 And according to Nico Nico News, since the 22-year-old has loved Pikachu from childhood, he decided to register as “Yago Pikachu” as his official player name.